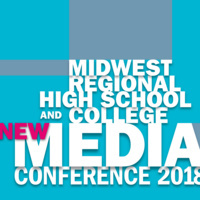 The 16th Annual New Media Conference at Columbia College Chicago will feature a who’s who of working professionals, with more than 25 panels and workshops. Professionals working in Film, Television, Animation, Video Games, Journalism, Communications, Voiceover, Radio, Comedy, Podcasting, Audio, Music, Public Relations, Advertising, Music Business, Talent Management and many more fields will take the stage! With an emphasis on career development and employability in the Arts, the conference is free to all Columbia College Chicago students and alumni, as well as all high school students who RSVP. In addition to access to the conference, those who RSVP by October 15 will receive a free lunch on the day of the event. • On-Air Success: How Do I Get There? • Carving Out a Career in Comedy is No Joke! Guests, panels and workshops are still developing, so check back often for updates! High School Students: REGISTER HERE! Thought the panelist were great. The location changed at the last minute which was not communicated properly. Other than that, food was good & the check in was easy. Great event. Well run with engaged students. Thanks for having me. This was well worth my time. It is a well organized and well put-together event with a wide variety of panels, topics, experts, and discussions. The lunch speakers were fabulous and the music was great. I enjoyed many workshops and each one had plenty of valuable insight and interesting conversations to offer! This is my first time going and I found it to be especially rewarding and inspiring.